Happy Bloggers Challenge Friday! 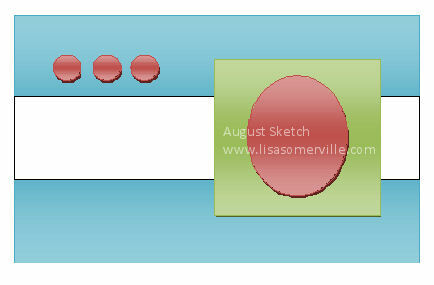 This week I gave the Bloggers Challenge players the following sketch to use for inspiration. As you can see, I took some creative liberties, using a framed oval and omitting the square panel. If you'd like to play along, simply leave your link in the comments section so I can see what you've created! 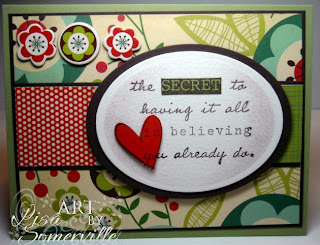 The sentiment is from the July Unity Stampin' Store Kit - Key to Joy and The Right Words. (note this kit is sold only in stores). I stamped in in Chocolate on Watercolor paper, added the Wisped Frames Technique in Chocolate ink, restamped the sentiment on Pear and Cherry Cobbler panels and cut out as shown. For more inspiration using this weeks sketch, click on the Bloggers Challenge Logo on my sidebar to see what the other players created this week. What a sweet sentiment to go along with such a sweet card. Love all the bright colors and patterns. I also loved the sketch! Very pretty! The saying is wonderful and the paper is pretty! What a sweet, happy card. Well done! Very pretty Lisa! Love your choice of background papers! Just lovely! Have a great weekend! Ohhh great card, Lisa! Love how you stamped the sentiment with the heart! Fun papers too. Leftovers from the cookbook kit? Enjoy the remaining portion of your vacation! What a fun sketch! I love the colors you used in your pretty card! Super fun card. Love the colors/patterns and that great quote. Lovely sentiment and great paper. Awesome card! Beautiful card, love what you are doing with that sentiment. I finally got my card finished & it will post tomorrow. Love how you highlighted the text! Fantastic colors! Fabulous card, love the papers you used! What a beautiful & colorful card! Love the saying. I think your ideas for the BC are great. My project is almost finished--will load it soon. Love the sketch but these colors are fabulous -- DSP is gorgeous and this is just a great card! What a great saying - Love it ! GREAT card....love all the elements on this one. Perfectly combined! That saying is one of my favorites and is perfect here. Such a beautiful card. I love the papers and the sentiment is so wonderful. I love the sentiment and the layout you chose this week. Such nice DSP you selected for your card. Very nice. Like everything about this card! Layout is fantastic and colors are super. Love the flowers on top and the heart! So fun. Great job on the sketch!